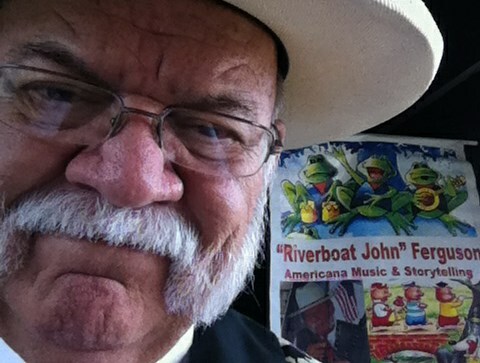 Heralded by the New York Times, The Chattanooga Free Press, The Nashville Tennessean, New Orleans Times Picayune, and numerous other media as a "True American Minstrel & Folk Lore Storyteller", "Riverboat John" grew up in Alabama, near the Tennessee River & received his first banjo at age 5...His mother taught him numerous stories & songs at an early age... After graduation from high school, he migrated to Greenwich Village, New York, to join the Folk Revival Movement, where he bumped elbows with the avante garde, Folk, Blues, Jazz, Pop, Gospel & Rock performers of the day...He completed his degree from George Washington University, Washington, D.C.; served in the U.S. Army; traveled the world; traveled the rivers of America; rode some of the last regular scheduled passenger trains; & rode on every paddlewheel boat he could find...As a result of his roots, travels and experiences as a "seasoned" stage performer, doing festivals, fairs, historical events, performing with symphonies, lecturing at Chautauqua & other lyceum venues, "Riverboat John" developed a style of entertainment much like that of an 1800's minstrel who comes to town to tell stories & sing songs. His programs are always adaptable to his audiences of all ages and backgrounds... 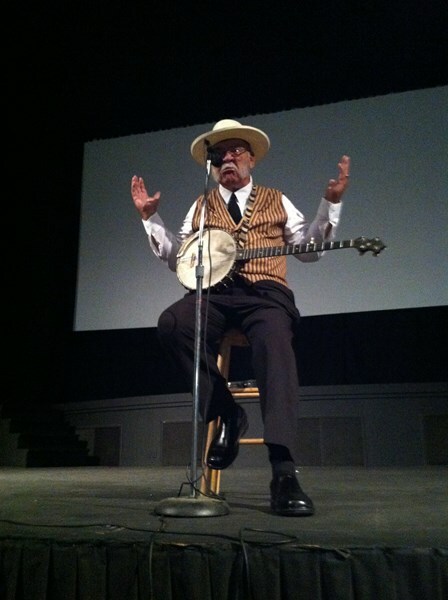 He plays his own style of banjo, guitar & other instruments & can belt out a tune of Folk, Gospel, Cowboy & Western, Dixieland, Mountain, River Blues, Country, Old Standards, Children's Songs, Historical, Patriotic, Original, Humorous & Serious, or tell a story at the drop of a hat. He's performed with symphonies & ballets, as well as numerous personal appearances, concerts and educational projects with schools & universities...He has been lauded for his work by many including the Parents Magazine Children's Programming Award...He is a nationwide programmer with the National Council on the Arts Big Read Program; the Dolly Parton Imagination Library Program; and the Better Basics Reading Enrichment Program... He has received the Dollar General Grant Award for aid with Adult Literacy Programs; and is heavily involved with the Read Across America Program... His Imaginative Reading, Creative Writing & Character Education programs have been implemented in many points throughout the United States...He is a much sought after motivational and keynote speaker and inspirational speaker. 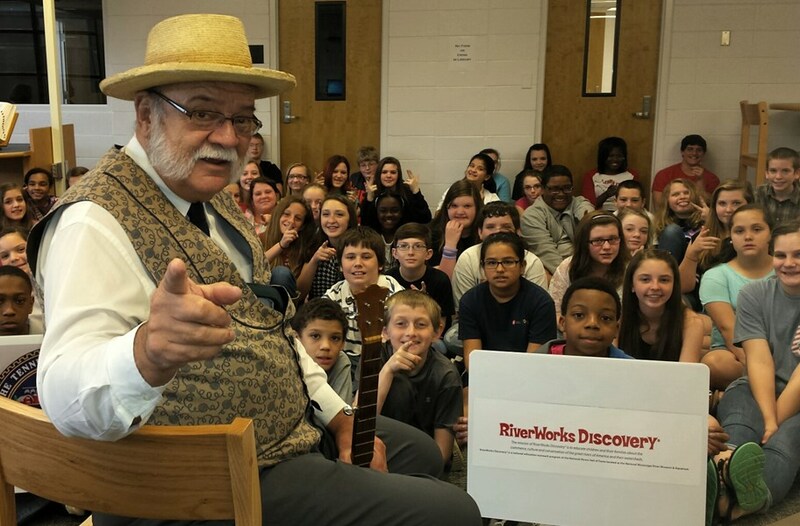 Motto: "LEARN TO READ-READ TO LEARN"
Chattanooga Free Press says, "Tom Sawyer & Huck Finn all wrapped up in one, a banjo on his knee and river water in his veins". New Orleans Times Picayune says, "A real character from the riverboat days and one of the best strolling acts we have seen in awhile"! New Orleans Jazz Fest; "One of the best roving acts we've had in a long time and we loved his original material". Tall Stacks, Cincinnati; "His third time with us and ready for the next one. We like him"! World of Nations Festival in Jacksonville, FL, "On the boat, on the grounds, in the food court! He's everywhere"! Motlow College, "An intricate part of our story telling festival". Greater Baton Rouge State Fair; "Three years in a row as a premier roving entertainer". San Antonio Rodeo & Livestock Show, "Unbelievable. He had real cowboys and cattlemen standing at all six of his shows every day for 17 days. Who would believe that someone from Alabama that does not claim to be a cowboy could hold a crowd of the "real thing". The Cowboys of Texas!" Bay Minette, Alabama Community Concert Series, "They all liked him so much they drove all the way across town for the after concert reception and stayed way past the designated time to be with him. He was great!" Please note 'RIVERBOAT JOHN' FERGUSON will also travel to Cullman, Cleveland, Holly Pond, Garden City, Baileyton, Altoona, Hanceville, Oneonta, Joppa, Horton, Arab, Remlap, Decatur, Eva, Mooresville, Belle Mina, Gallant, Hayden, Guntersville, Trafford.